The problem with having a lot of hobbies is that your time has to be divided among them or you just don't do some of them at all. Sewing (and blogging) have been pushed aside over the last few months while I've spent my time on knitting, weaving and traveling. I'll save the weaving and traveling for another post because today I give you what I call sockapalooza. 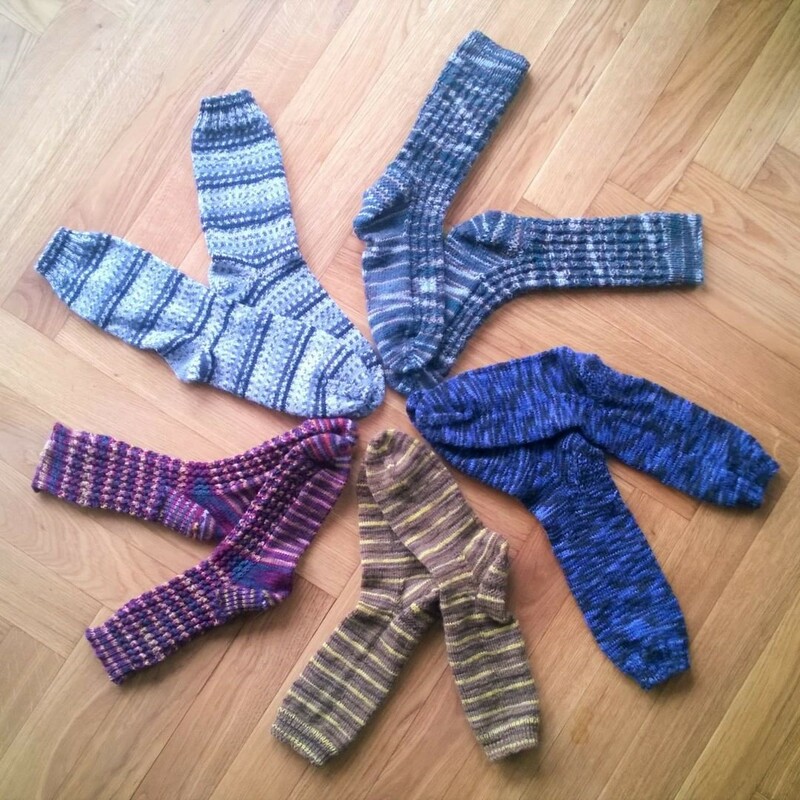 Yarn: Blue Moon Fiber "Socks that Rock"
Comments: These were started years ago and languished among my knitting UFOs. I like the look of the pattern but it uses a lot of K2tog and SSK and it was hard on my hands to knit it. I probably should have gone up a needle size, which would have made knitting them easier and they'd fit better. Comments: I love, love, love these socks. This is some of my oldest yarn from my stash, probably purchased 10 years ago when I picked up knitting again (I'd knit in college, a long time ago and a little while after that but not very much). I like the self-striping pattern - and I matched the two socks! The best thing about these socks is the fit. I think I've been making my socks too small in the past; these are larger and I like the fit much more. Comments: I knit these socks mostly on the train to and from Berlin. They were easy to knit and once I found that a combination of Regia yarn, 2.5 mm needles and 64 st cast on made the perfect size sock for me, I quickly made another pair (the gray striped socks above). Comments: I took really poor notes for these socks that I made for my husband. I know I went up a needle size because the stitch density was not as great as I would have liked. These will probably wear out quickly because of that, but it was inexpensive yarn and I knit them pretty quickly, so I'll just make him another pair. Comments: I definitely should have gone up a needle size or cast on more stitches because they're a bit snug. I didn't use a pattern because I liked the stripes, which I managed to match almost perfectly. Despite the fact this yarn was called "Men", I made these for myself because I didn't see my husband wearing butterscotch socks, though he does like butterscotch. I always try to have a sock project in work because they make great travel projects. Right now I have one sock nearly finished using yarn I bought in Istanbul two years ago. However, the bigger knitting project right now is a sweater that I'm making for my husband. All I can say is that sweaters take a long time, I'm sick of garter stitch, and I'm anxious to get it finished so I can start something else. And I really hope it fits him. In comparison, socks are a lot easier!